It must be lonely out there for a world-renowned DJ. 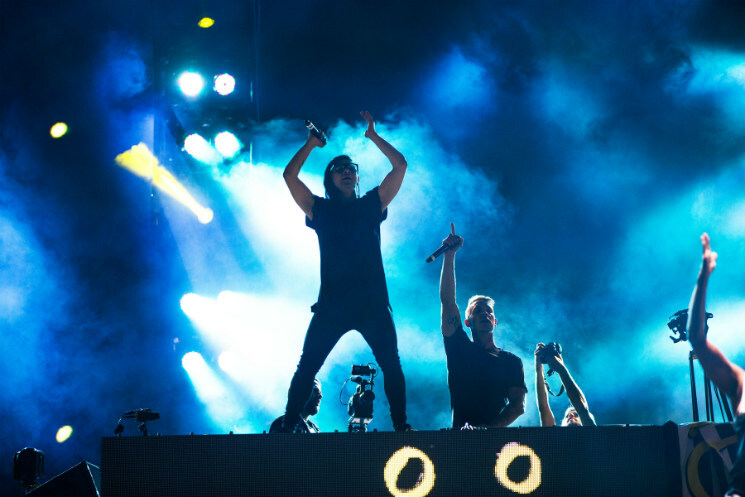 That's the only reason one could logically assume why Skrillex and Diplo — two of EDM's biggest superstars — decided to join forces as the double-headed dubstep/trap-lite duo Jack Ü, a project that finds the two giving the performances of their lives, but looking less connected to their music than ever before. Although more casual fans and the occasional family with a plethora of Festival d'été passes who gathered to watch the laser-strewn spectacle on the opening night of the festival seemed to be having fun, it seemed a bit harder for more seasoned concertgoers to swallow the DJ duo's charades and escapades on stage during their Full Flex Express headlining set. After gliding across the Bell Stage aboard some sort of futuristic electronic skateboard/rollerblade hybrid that made Segways look cool in comparison, the pair were soon joined by previous performer Kiesza and her dancers to do their hit "Take Ü There." It was an odd choice to have a special guest appear right off the bat, as opposed to throwing them in midway through the set to reinvigorate the crowd, but Skrillex and Diplo were the true stars of the show here, but they acted like everybody came to see them rather than hear their music. It was actually refreshing to watch a DJ duo not be restricted by their turntables and instead dance on top of them, around the stage and wave flags (the Fleurdelisé, in this instance) with abandon and little care for what it looked like they were doing behind the decks. But with so many over-the-top stage theatrics — including not one, but two moments in which one of Jack Ü's members had to be "revived" after "passing out" by the sound of cheering fans — it was hard after a while to understand what their role as performers was, outside of acting as on-stage cheerleaders for their own pre-produced beats, and that kind of thing gets boring real quick.